Primary purpose of this lecture is to presentation on Systems Analysis. Systems analysis is a problem solving method that decomposes something into its component pieces for the purpose of the studying how well those aspect parts work and interact to accomplish their objective. This lecture briefly describe systems analysis and relate the term to the preliminary investigation, problem analysis, requirements analysis, and decision analysis phases of the systems development methodology. 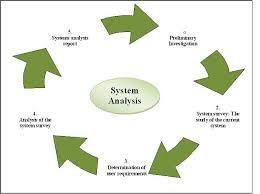 Finally analysis a number of systems analysis approaches for solving business system problems.